Deeper Greens is a convenient drink mix that provides beneficial nutrients from berries, fruits, vegetables and greens to support a healthy diet. This complete formula combines concentrated fruits and berries with a vegetable antioxidant blend to help build antioxidant reserves and protect the body from free radical damage. In addition, Deeper Greens includes a “superfood” blend with additional phytonutrients and micronutrients to help boost energy levels. Deeper Greens is gluten-free and dairy-free and is also available in capsule form. Fruits and vegetables contain a high ORAC value. ORAC value is a unit value assigned by researchers to measure the antioxidant value of a given food. Foods with a high ORAC value are beneficial to the body and contribute to balanced antioxidant status. Antioxidants fight free radicals, the agents that can cause cellular damage. 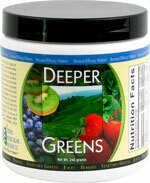 Deeper Greens contains all natural organic fruits (where available) and provides a high ORAC, antioxidant blend. 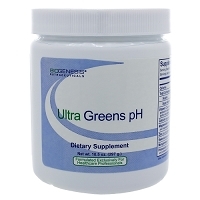 Deeper Greens incorporates the latest science of the highest ORAC fruits and vegetables and is formulated in a satisfying single serving to help patients fulfill their dietary needs. Fruits and vegetables have an exceptional combination of antioxidants that deliver greater nutrient value and absorption than standard antioxidant supplements. Organically grown plants traditionally have higher total phenolic compounds. In a recent study at UC-Davis, researchers found higher amounts of total phenolic compounds, such as flavonoids, anthocyanidins, catechins and tannins, than in traditionally grown fruit. An increase in these secondary antioxidant metabolites help better support diets lacking in fruits and vegetables. 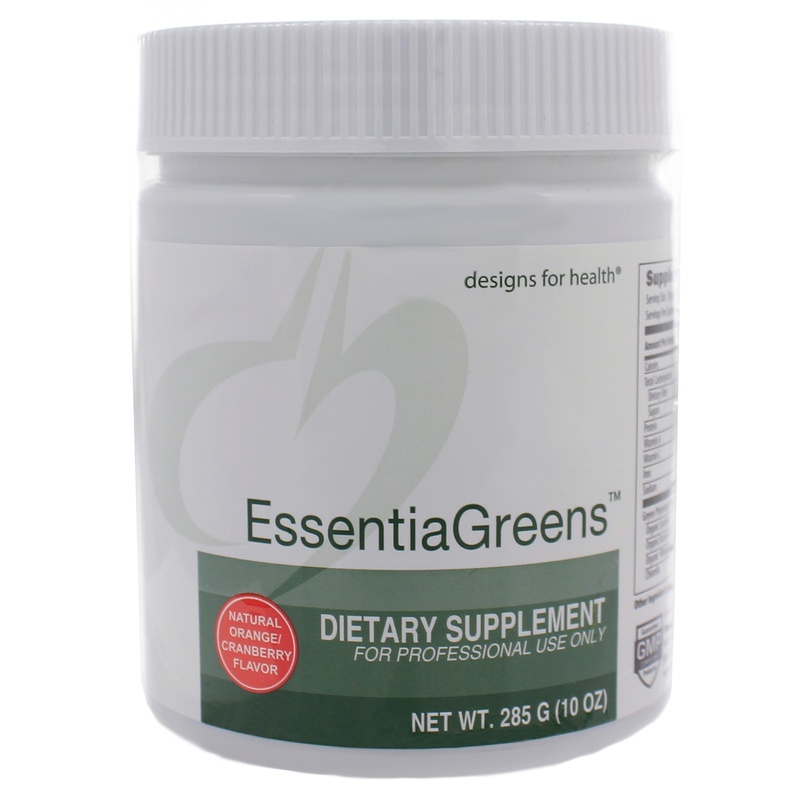 The combination of spirulina and wheat grass creates a powerful nutritional energy boost. Spirulina is a blue-green algae that has been used effectively as a health supplement since ancient times and has been shown to support heart, brain and metabolic health. [2, 4] Spirulina is a rich source of a variety of phytonutrients and antioxidants, including selenium, phenolic acid, vitamin E and carotenoids. This nutrient-rich, underwater plant is also a significant source of protein and the amino acids valine, leucine, isoleucine, omega-6, omega-3, vitamin B1, zinc, vitamin B2, iron, beta carotene, manganese and copper. Wheat grass provides a number of concentrated nutrients, including iron, calcium, magnesium, amino acids, chlorophyll and vitamins A, C and E. Wheatgrass is known to support immune balance, antioxidant status and gastrointestinal health, as well as enhance nutrient consumption. 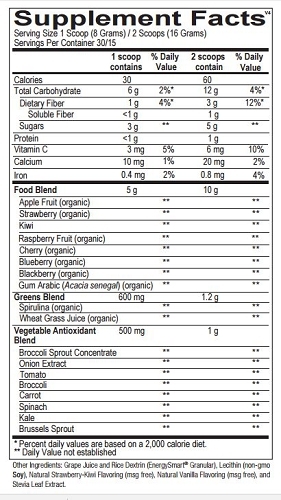 [5, 6] It is important to note that wheatgrass does not contain gluten. It is removed from the wheat grain that contains gluten. Diets low in saturated fat and cholesterol, and rich in fruits and vegetables that contain some types of dietary fiber—particularly soluble fiber—may reduce the risk of heart disease, a disease associated with many factors. 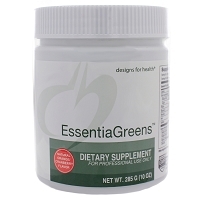 The Deeper Greens formula provides natural antioxidants from fruits and vegetables. 1. Asami DK,et al. Comparison of the total phenolic and ascorbic acid content of freeze-dried and air-dried marionberry, strawberry, and corn grown using conventional, organic, and sustainable agricultural practices. J Agric Food Chem. 2003 Feb 26;51(5):1237-41. 2. Wang Y, Chang CF, Chou J, Chen HL, Deng X, Harvey BK, Cadet JL, Bickford PC. Dietary supplementation with blueberries, spinach, or spirulina reduces ischemic brain damage. Exp Neurol. 2005 May;193(1):75-84. 3. Van Duyn MA, Pivonka E. Overview of the health benefits of fruit and vegetable consumption for the dietetics professional: selected literature. J Am Diet Assoc. 2000 Dec;100(12):1511-21. 4. Kalafati M, Jamurtas AZ, Nikolaidis MG, Paschalis V, Theodorou AA, Sakellariou GK, Koutedakis Y, Kouretas D. Ergogenic and antioxidant effects of spirulina supplementation in humans. Med Sci Sports Exerc. 2010 Jan;42(1):142-51. 5. Sethi J, Yadav M, Dahiya K, Sood S, Singh V, Bhattacharya SB. Antioxidant effect of Triticum aestivium (wheat grass) in high-fat diet-induced oxidative stress in rabbits. Methods Find Exp Clin Pharmacol. 2010 May;32(4):233-5. 6. Ben-Arye E, Goldin E, Wengrower D, Stamper A, Kohn R, Berry E. Wheat grass juice in the treatment of active distal ulcerative colitis: a randomized double-blind placebocontrolled trial. Scand J Gastroenterol. 2002 Apr;37(4):444-9. 7. Griffiths G, Trueman L, Crowther T, Thomas B, Smith B. Onions--a global benefit to health. Phytother Res. 2002 Nov;16(7):603-15. 8. Kim SY, Yoon S, Kwon SM, Park KS, Lee-Kim YC. Kale juice improves coronary artery disease risk factors in hypercholesterolemic men. Biomed Environ Sci. 2008 Apr;21(2):91-7. 9. McMillan M, Spinks EA, Fenwick GR. Preliminary observations on the effect of dietary brussels sprouts on thyroid function. Hum Toxicol. 1986 Jan;5(1):15-9. 10. Vasanthi HR, Mukherjee S, Das DK. Potential health benefits of broccoli- a chemico-biological overview. Mini Rev Med Chem. 2009 Jun;9(6):749-59.